Many many apologies for the long break from the blog! I've been fortunate to be able to take up a Masters Degree in recent months and its kept me very busy. 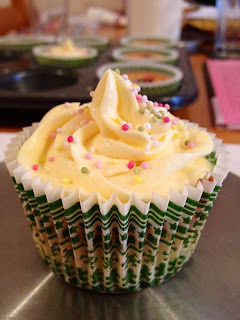 I do however now have a regular baking guest column over on HugoFox.com so please do check it out. I was in a baking mood today and wanted to try something I'd had at my Student Union coffee shop. There is a fantastic baking company in Sheffield called Fancie and as I'm up there for my course on an almost daily basis I've become a fan. The first one of their's I tried was a Victoria Sponge Cupcake. However my baking brain kicked in as I ate it and started thinking that I could probably make something similar myself. Luckily Santa brought me things at Christmas to stock up my baking drawer and one of them was a cupcake plunger (this one to be exact) which allows you to take a round section out of the middle of the cupcake to put in a filling. So I used my 'go to' vanilla cupcake recipe, filled them with strawberry jam and topped with buttercream. Delicious! Preheat the oven to 170 degrees and line a muffin tin with muffin cases. Use a handheld whisk or a mixer with a paddle attachment to beat together the butter, sugar, flour, baking powder and salt until all ingredients are well mixed. When the mixture has a sandy consistency then you're done. Gradually add in half the milk and mix. Separately, mix together the other half of the milk, the vanilla essence and egg in a jug. Add to the dry mix with the mixer set on slow speed. Once all is added, set mixer to medium speed until batter is smooth. Spoon the mixture into the cases, no more than two thirds full. This quantity should make 12 cupcakes. Leave to cool slightly before removing from the tin and until fully cool before adding the jam and icing. 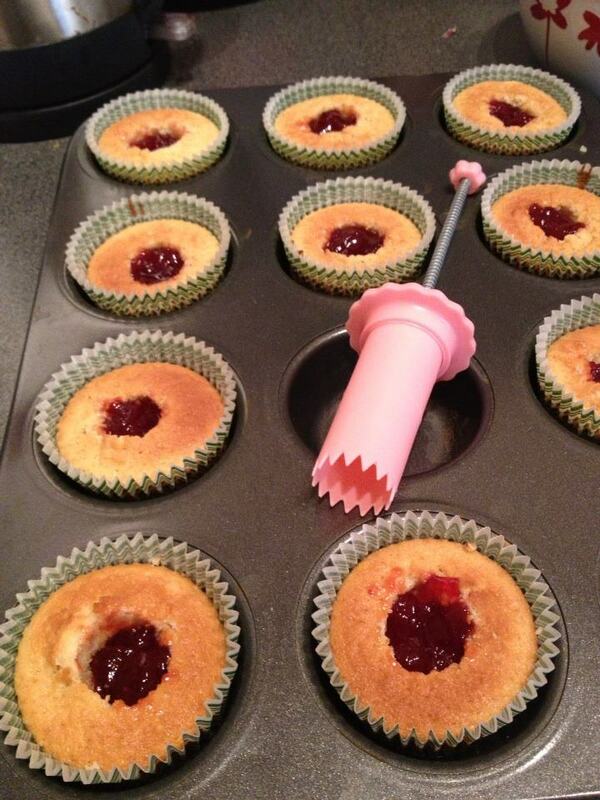 Once cool use your cupcake plunger to remove the centres and spoon in strawberry jam until level. Mix your buttercream icing and pipe on with a piping bag with a star tip. Start it the centre then curl round to cover the top, ending in the middle. For a bit of colour, add some hundreds and thousands!